Historic Hilltop Cemetery, published by the Summers County Historical Society, is a 200 plus page 8 ½ x 11 paperback that lists not only the names and dates of those buried at Hilltop, but other information found in their courthouse death records, such as cause of death and parents' names. 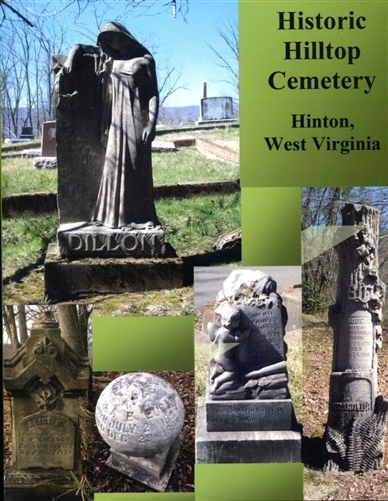 In addition, many obituaries are included giving a wealth of historical information about the city of Hinton and its surroundings: genealogical information, names of pastors and churches, names of social and fraternal organizations, names of businesses and their owners, names of diseases common in the late 1800's and early 1900's and the primitive state of medical procedures at the time. The importance of the C & O Railroad in the community is seen through the number of people buried at Hilltop who were employed by the railroad. Unfortunately, many of them died as a result of railroad accidents that were a part of everyday life. These accidents are often vividly described in obituaries written more like news stories than today's obituaries. Many photos of the more unusual tombstones and inscriptions have been incorporated plus maps showing each family plot.